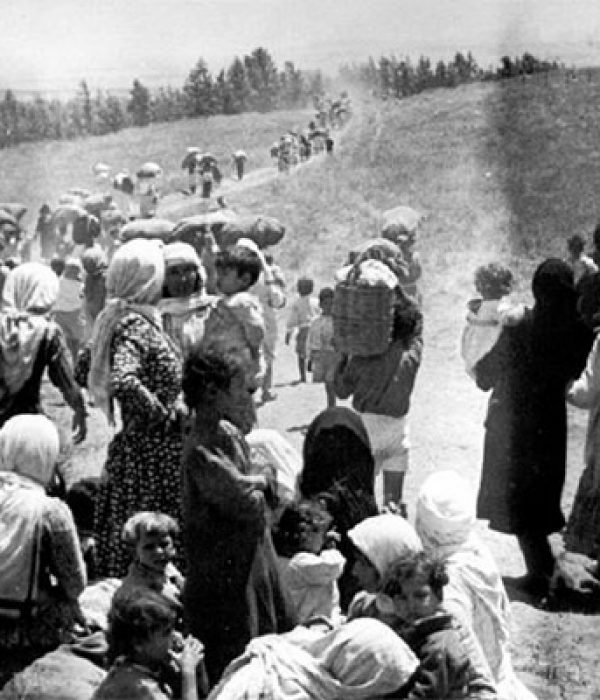 While hundreds of thousands of Palestinians were wandering around and forced to leave their memories, homes and towns; searching for a burial place for their martyrs or a shelter to protect their children, the leaders of the Zionist movement were gathering to announce the establishment of a new entity on the land of those expelled, they declared “Israel”, which caused the emergence of Al-Nakba. In Arabic (النكبة) al-Nakba means catastrophe or disaster, a term that summarizes what happened to the Palestinians when the Zionist forces completed the occupation of most of the Palestinian lands and they declared “Israel” as their Jewish national home on 14 May 1948. Al-Nakba is not just a catastrophic event, or a grievous day in the life of the people of Palestine. 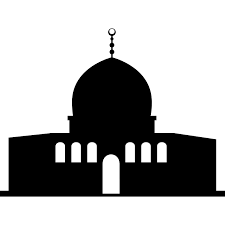 It is long and extended chapters of injustice, cunning, settlement, aggression, ethnic cleansing, murder and forced displacement, side by side with other extended chapters of pain, memories, deprivation, refuge, resistance and dream of the day of return.In the next paragraphs, “Al Quds Foundation Malaysia” tracks the events that led to al-Nakba and investigates its results in a brief and focused manner. We can say that the roots of the Nakba date back to the late 19th century, when Palestine was part of the Ottoman Empire. At that time, Jewish nationalism, called Zionism, developed in Europe. The father of political Zionism was the Austro-Hungarian Jew Theodor Herzl. At the first Zionist Congress in 1897 in Basel, not only was the idea of Zionism established on a broad basis, but institutions were also created. The first Zionist Congress announced the establishment of the World Zionist Organization which basically aimed to establish a national homeland for Jews in Palestine under international patronage and acceptance. To achieve this goal, the Zionist program was established to encourage the Jews around the world to migrate and settle in Palestine. When the first Zionist immigrants began to arrive to Palestine, the number of Jews in Palestine did not exceed 5% of the population of the country, part of them were those who fled from Andalusia after its fall. With the support of wealthy Jews and the great efforts made by the Zionist movement, the immigration of Jews to Palestine took place in several waves of immigration, at first mainly from Eastern Europe. The first wave of immigration was in 1882, The number of Jews in Palestine was only 24,000. In 1906 there were 70,000 people in Palestine, 55,000 of them Jews (including the Jews of Palestine). In the second wave of the Zionist immigration (1904-1914), the number of the immigrants reached about 40,000; the vast majority of them were from Russia and Romania. They were mainly young adventurers inducted by the colonial and Zionist organizations. The Zionists achieved a first successful step towards their own state with the Balfour Declaration on Nov. 2nd, 1917. 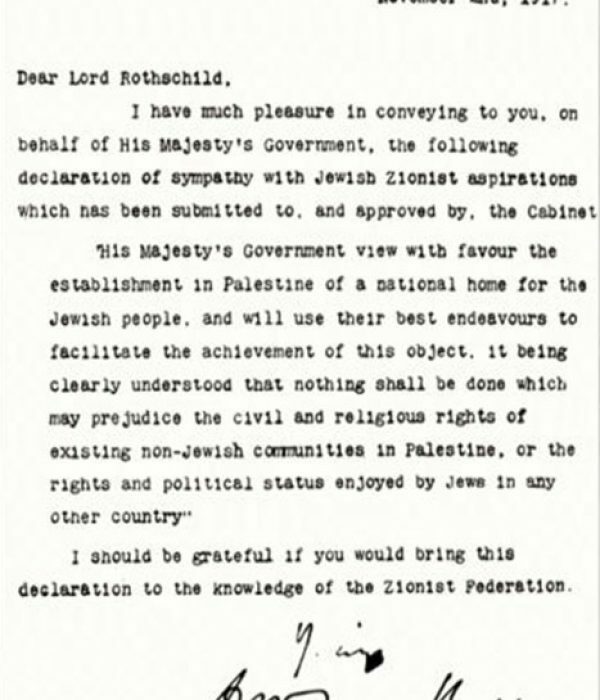 The British foreign minister at that time, Balfour, in a letter to the organized Zionists in Britain, stated the willingness of the British government to support them in establishing a national home in Palestine. At that time, Palestinians were not cited by name in the letter even though they were more than 91% of the population of Palestine. Indeed, they were defined by what they are (non-Jewish), which set the pattern for their “invisibility” in later official discussions about their future. Britain started occupying the Palestinian lands from the Ottoman Empire immediately after its promise for Jews which was known as “Balfour Declaration”. 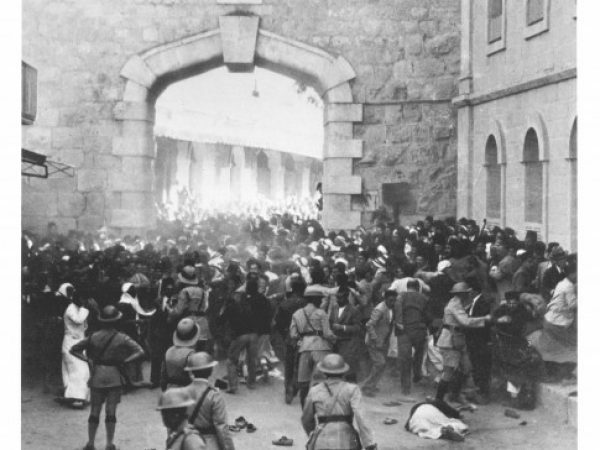 By 1918, Palestine was completely under the British occupation. 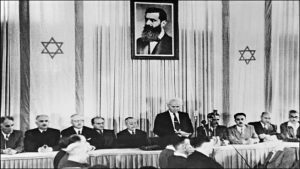 Since then, Britain has pursued a Zionist policy aimed at dispossessing Palestinians’ lands for the Jews, Increasing the number of Jewish immigrants from Europe, and establishing the institutions of a “future Jewish state”. On the other hand, the British occupation suppressed the Palestinians and manipulated them. 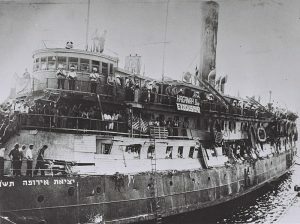 Jewish immigration ship after the British takeover. After the end of the First World War, Britain became the Mandatory power for Palestine in 1922. The text of the Mandate assured the Zionists the right to establish a national home in the Mandate territory west of Jordan, and supported further Jewish immigration. A series of statutory regulations introduced from 1920 on by the first British High Commissioner of Palestine, Herbert Samuel, promoted the development of a separate economic and social infrastructure for the Jewish community. Nothing was said in the text of the Mandate about the national rights of the largely Arab inhabitants. Following the Balfour Declaration and the subsequent assumption of the Mandate, there was a substantial increase in Jewish immigration to Palestine. In the third wave of immigration (1919-1923), about 35,100 Jews were deported to Palestine and in the fourth wave (1924-19 31), about 78,898 Jews were deported to Palestine, mostly from Germany, Western Europe and Poland, While the fifth wave of emigration in the period (1932-1939) was the most important migration in the history of the Zionist movement, about (224,784) Jews were deported towards Palestine. The consequences of the immigration were becoming increasingly obvious to the native population. For example, the Jewish settlement of Tel Aviv, founded right next to the Arab port city of Jaffa, grew from 3,600 inhabitants in 1921 to 40,000 in 1925. 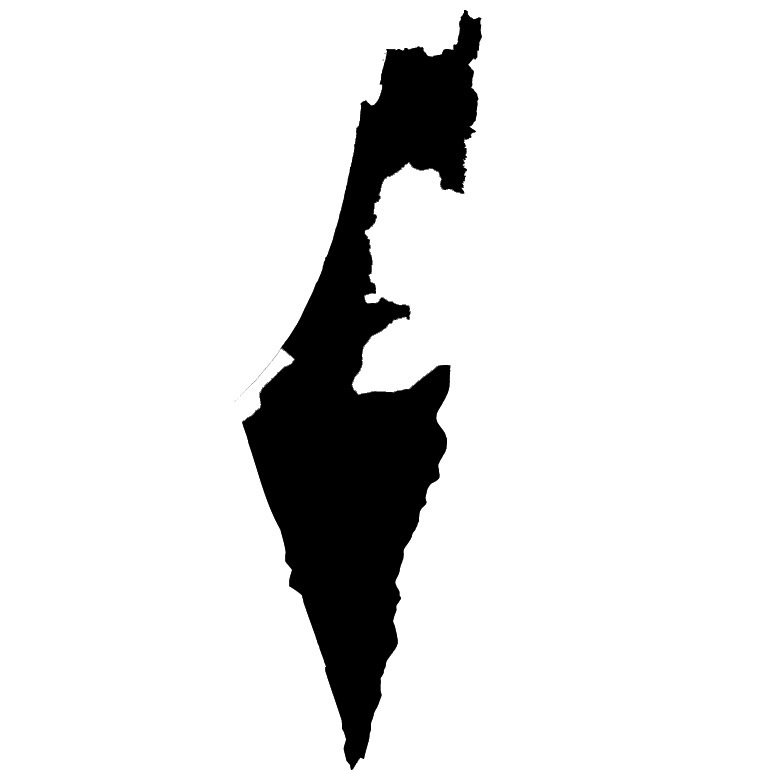 The establishment of a Jewish state in Palestine, also became apparent. 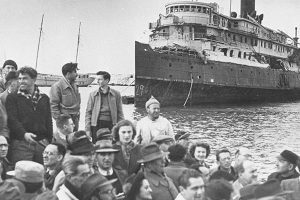 During the World War II, about 55,000 illegal immigrants arrived to Palestine. At that time, the British navy was charged of guiding the ships of the Jewish immigrants, providing them with water, supplies and fuel, and driving them to the Palestinian coasts. In addition, about 120,000 Jews entered the country between 1940 and 1948. By the end of the British mandate period, the number of Jews reached 625 thousand, which represented one-third of the population of the country at that time. 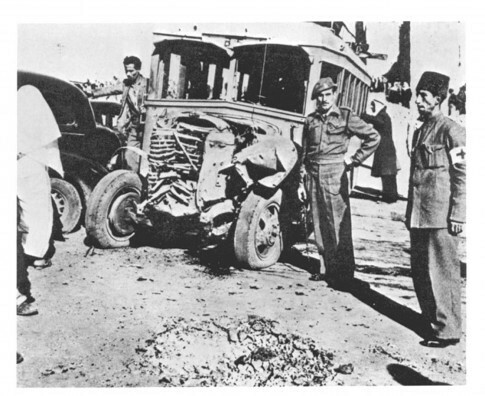 A truck was exploded on 4 January 1948 by members of the Stem Gang. It destroyed the building and killed 26 Palestinian civilians. Although the beginnings of the Zionist military formation of immigrants in Palestine date back to 1907, the British Mandate (1917-1948) constituted a quantum leap in the quantity and quality of the Zionist military forces on the land of Palestine. In 1920, the Zionists established the “Jewish Defense League”, henceforth “Haganah”, which began to purchase arms from abroad, especially from Austria. The Haganah developed its professional leadership abroad. They had their own independent weapons and foreign contacts, and became a regular army over time. Next, a group called “Palmach” was founded. They were very radical and used to attack the Palestinian villages. 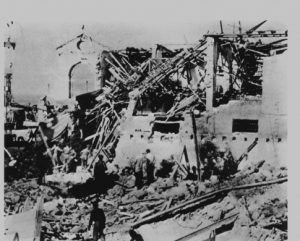 In 1937, The Haganah had also a more extreme right-wing organization called ETZEL which attacked together with men from the ‘Argun’ King David Hotel in Jerusalem. 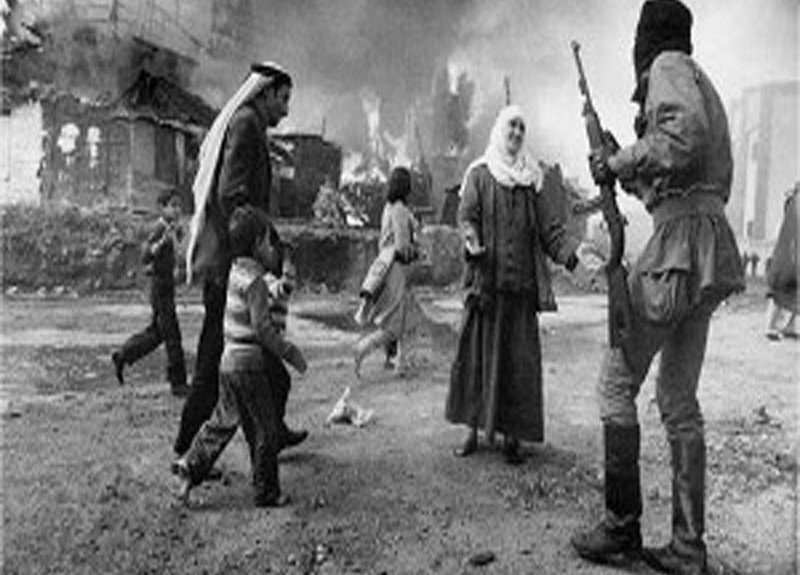 They also ؤommitted Deir Yassin massacre. “Menachem Begin” was one of the most prominent leaders of ETZEL. During that time, “Lehi” organization, sometimes known as the ” Shtirn Gang,” was active in the cities, not in the villages. The British Mandate provided support, military training, weapons, ammunition and protection to these Zionist military gangs. In return, it did not hesitate to suppress any Palestinian resistance movement. The Palestinian national movement focused, particularly during 1918–1929, on peaceful resistance against the Zionist project and on the attempt to convince Britain to renounce the Balfour Declaration. It was still hopeful that this could happen, especially as the British were the allies of Sharif Hussein during WWI. The Zionist project had not yet achieved any practical results that had irreversible repercussions on the situation in Palestine. The Palestinian national movement developed in the 1930s as a result of the intensive Zionist immigration and the loss of hope for any improvement in Britain’s stance. 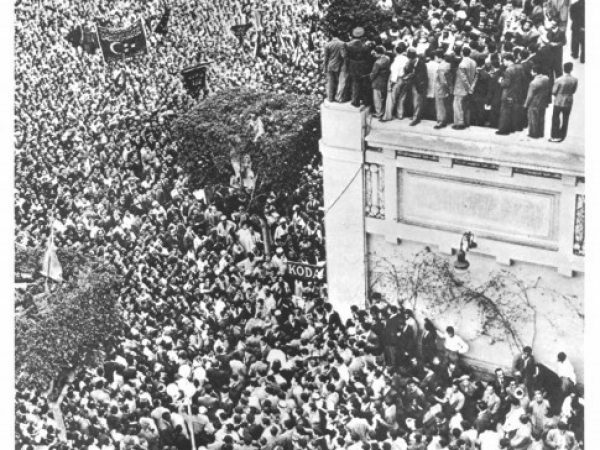 In 1936, a general strike lasting six months was called, accompanied by demonstrations, notes of protest, and armed conflicts across the country.The Peel Commission’s partition plan of 1937 caused the uprising to escalate further, until in 1939 it was crushed finally and bloodily by the British Mandatory power, partly with the aid of the Zionists. Thousands of Palestinians were murdered or arrested, including the entire leadership, some of which were executed or driven into exile. On 29 November 1947, the General Assembly of the United Nations voted to adopt the majority’s plan and to divide the British Mandate territory of Palestine into a “Jewish state,” an “Arab state,” and the City of Jerusalem as a “corpus separatism,” placed under U.N. administration. All three components were to be joined in an economic union. The Arab port city of Jaffa was to belong to the “Arab state” as an enclave. The plan did not provide for ethnically or religiously homogeneous states, but rather regulated the rights of the respective minority. It is worth noting that UNGA resolutions are not binding, even within the UN charters themselves. The resolution itself is in contradiction with the basis upon which the UN was founded, namely the right of people to freedom and self-determination. Moreover, the Palestinian people, the ones who are concerned by the issue first and foremost, were not consulted. This is in addition to the blatant injustice imposed by the resolution in giving around 55% of Palestine’s land to an immigrant Jewish minority and possessing no more than 6% of the land. 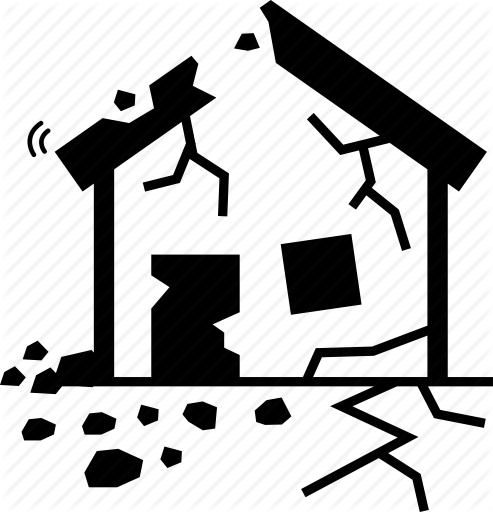 Immediately after the adoption of the U.N. partition resolution, the armed conflicts in Palestine began, in the course of which almost half of the total of 750,000-800,000 Palestinian refugees already had to leave their homes. In addition to military actions by the clearly superior Zionist militias, acts of terrorism, and initially economic measures, by the Zionists led to the flight and expulsion of the native Palestinian population. 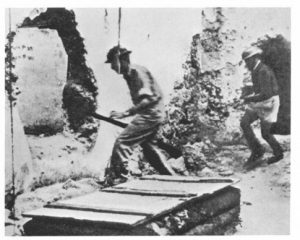 By blockading the supply routes and conquering surrounding villages, the most important Arab towns intended for the “Jewish state” were cut off from supplies of raw materials and starved out. The numerical superiority of the Jewish Zionist militias was supplemented by their high motivation. In addition, there was their excellent level of military training, which many combatants had acquired as soldiers in World War II and as members of the Zionist police force trained by the British during the Mandate. 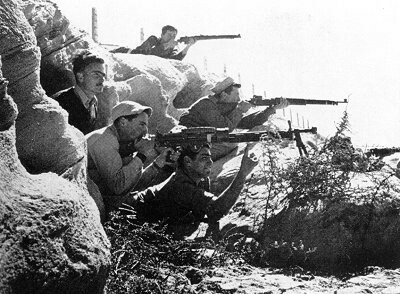 Fighting on the Zionist side during this phase were the 30,000-strong Hagana, and the Revisionist militias Lehi and Etzel (or Irgun), which had already distinguished themselves by terrorist attacks against the British Mandatory power before and during World War II. The commander-in-chief of Etzel was the later Israeli Prime Minister Menachem Begin. In addition to these, there were 20,000 Zionist auxiliary forces who lived in the various settlements. 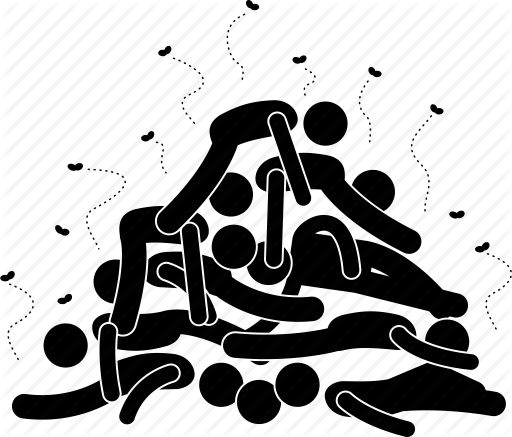 On the Arab side, there were two to three thousand guerrillas under Palestinian leadership, and 2,500 to at most 4,000 mainly Syrian and Iraqi volunteers of the Arab Liberation Army under the leadership of the Arab League. Road blockades and bloody raids on Palestinian villages or Jewish settlements were the main aspects at first. Within a mere six weeks, up to 10 January 1948, the violent conflicts cost the lives of 1,974 people on both sides; up to 31 Dec. 1947, 205 of these were Jews. A substantial intensification of the Zionist military strategy occurred starting in April 1948, when the Zionists implemented their military Plan D (Dalet). From April on, massacres of the Palestinian population also increased, spreading great fear and increasing the mass flight considerably. An example of this was the massacre in Deir Yassin on 9 April 1948. 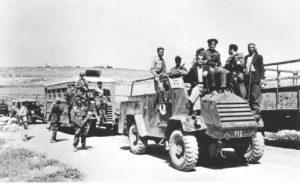 By the implementation of Plan D in several offensives, the Zionist militias succeeded in conquering more than 200 towns and villages and expelling their inhabitants before the State of Israel was even proclaimed on 15 May1948, and thus before a single Arab army had set foot on Palestinian soil. Irgunists moving through holes blasted in Palestinian houses. On the Israeli side, it is often claimed that the Palestinian population fled of their own will or due to calls by Arab leaders. For the period of combat until the proclamation of the State of Israel, including the first two weeks of war, the Israeli army itself gives figures that confirm they were forced to flee. An evaluation of radio recordings from that time refutes the second claim as well. In the eyes of the Palestinians, Plan D is the proof that, in the aftermath of U.N. Resolution 181 (II), the political and military leadership of the Zionists was working to expand the territory of the “Jewish state” and implement its ethnic purging. Israeli historians such as Simha Flapan, Benny Morris and Ilan Pappe document the expulsion, citing numerous sources. According to Ilan Pappe, an advisory group of leading Zionist representatives, headed by the subsequent Prime Minister of Israel, David Ben-Gurion, planned and implemented the ethnic purge. 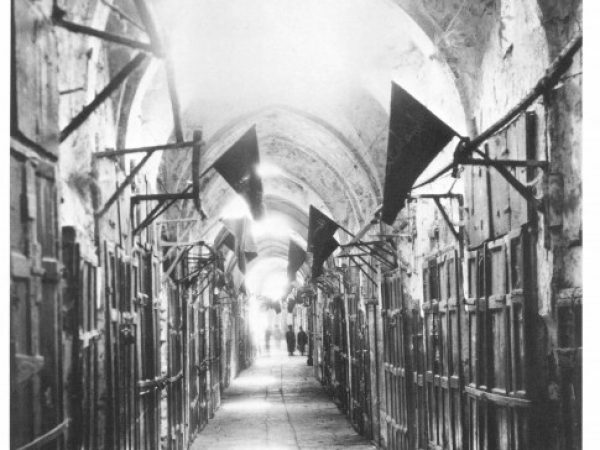 Arab Palestinian prisoners of war, Ramle, 12–13 July 1948. The Zionist gangs have committed more than 40 massacres during the war of the ethnic cleansing. 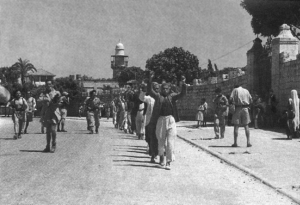 The most famous one was the Massacre of Deir Yassin on 9 April 1948. The inhabitants of the village of Deir Yassin, lying to the west of Jerusalem, had already concluded a friendship pact with the neighboring Jewish settlement Givat Shaul in 1942. They had not participated in any attacks on Jewish settlements. 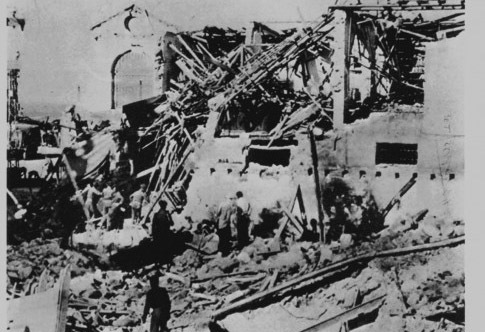 The terrorist militias Etzel [Irgun] and Lehi attacked the village together on the morning of 9 April 1948. Because some of the inhabitants resisted, they were only able to conquer the eastern part of the village. Therefore, a Palmach unit of the Hagana came to the assistance of the two militias, and conquered the entire village. After it withdrew, the Etzel and Lehi men fell upon the villagers and killed men, women, and children indiscriminately. 254 people were reported to be victims of the massacre. On the 9th of April, our men together with a LEHI unit captured the village of Deir Yassin. […] Our men were compelled to fight every house; to overcome the enemy they used large numbers of hand-grenades. 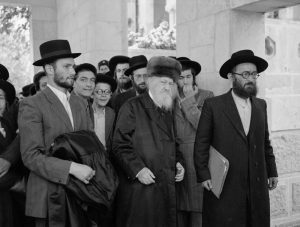 And the civilians who had disregarded our warnings suffered inevitable casualties.” Menachim Begin, commander-in-chief of the Etzel militia, Tel Aviv 1952. "We have forgotten that we have not come to an empty land to inherit it, but we have come to conquer a country from people inhabiting it." "those who left did not do so of their own volition." 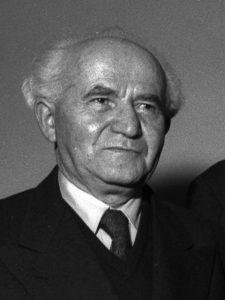 On 14 May 1948, the day before the expiration of the British Mandate, David Ben-Gurion declared the establishment of a Jewish state in Eretz Israel, to be known as the State of “Israel”. 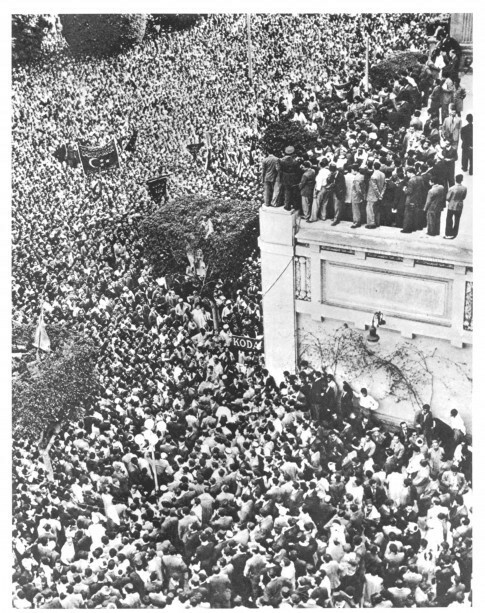 Both superpower leaders, U.S. President Harry S. Truman (de facto) and the Soviet leader Joseph Stalin, immediately recognized the new state, while the Arab League refused to accept the UN partition plan, proclaimed the right of self-determination for the Arabs across the whole of Palestine, and maintained that the absence of legal authority made it necessary to intervene to protect Arab lives and property. 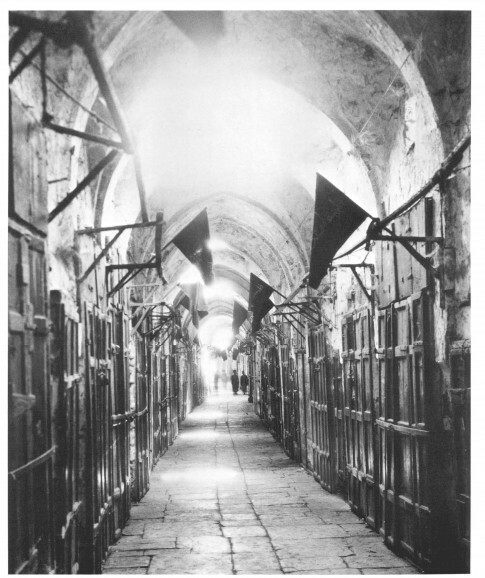 The Palestinians bore this war’s burdens alone during the first six months, with the help of a limited number of volunteers, as the Arab states refused to send their armies until Britain left, On 14 May 1948, the last British High Commissioner left Palestine, and David Ben-Gurion proclaimed the establishment of the “State of Israel”. 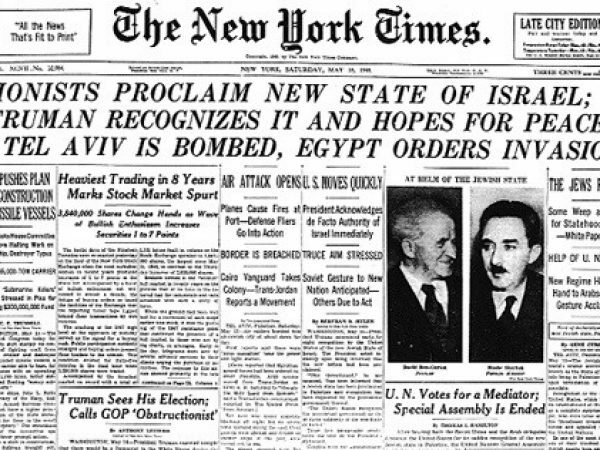 On 15 May 1948, the Arab states declared war on the Zionist entity “Israel”. 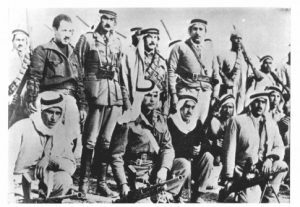 The involvement of the six Arab armies represented another tragedy, as they included a total of 24 thousand fighters up against more than 65 thousand Zionist Jewish fighters, and they suffered from a lack of coordination, were ignorant of the land, and lacked modern efficient weapons. Some of these armies occupied themselves with removing the weapons of Palestinians instead of arming them. Under the impression of the huge flows of refugees, On 11 Dec. 1948 Resolution 194 (III), known as the “Right-of- Return Resolution,” was passed by the General Assembly of the United Nations. It was based on the Universal Declaration of Human Rights adopted by the U.N. General Assembly. As a result of the failure of the international community to enforce ‘Israel’ to implement this decision for 70 years ago until now, the eastern border of Gaza Strip is witnessing a sit-in and peaceful marches (Great Return March) by tens of thousands of Palestinians who seek to implement the right of return. The ‘Israeli’ Occupation Forces (IOF) has suppressed the peaceful marchers with live bullets and tear gas. So far, dozens have been murdered and hundreds have been injured. 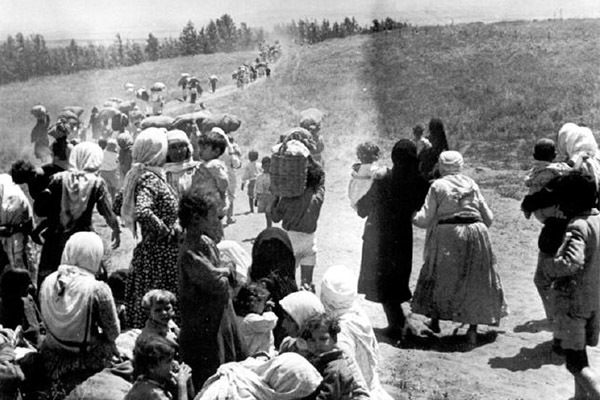 As a consequence of Al-Nakba, the Palestinians who were forced to leave their homes; were exiled to the Palestinian areas that were not occupied yet at that time (West Bank and Gaza Strip). The majority were exiled to the neighboring countries: Jordan, Syria, Lebanon, Iraq, Egypt, and other countries in smaller numbers. In December 1949, The United Nations Relief and Works Agency for Palestine Refugees (UNRWA) was established as a humanitarian aid organization by the General Assembly of the United Nations for the hundreds of thousands of Palestinian refugees. 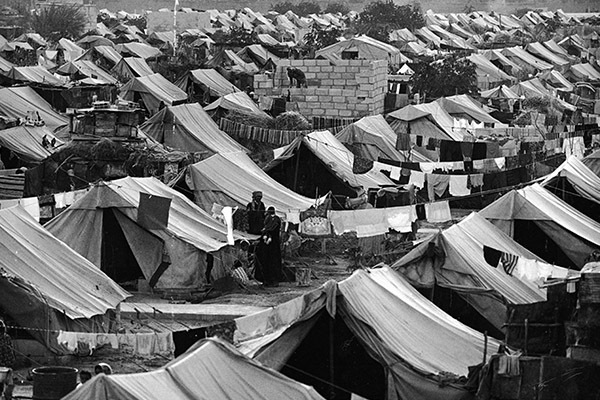 When it began its work in May 1950, it registered 914,221 refugees. Today, it supports almost five million refugees in the Near East. The task of UNRWA is to meet the basic needs of the refugees. That comprises the supply of education and healthcare, social services and emergency aid, and the accommodation and infrastructure in the refugee camps. 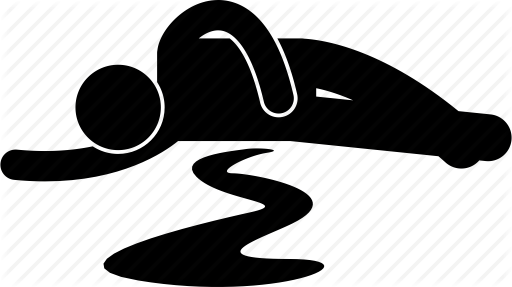 The areas where UNRWA works are Lebanon, Jordan, Syria, and the occupied territories of the West Bank and Gaza. The aid organization’s permanent under-funding leads to severe limitations of its services for the refugees. The situation has been made worse for these people for decades by constantly repeated military conflicts both in the occupied territories, in Lebanon and today in Syria. 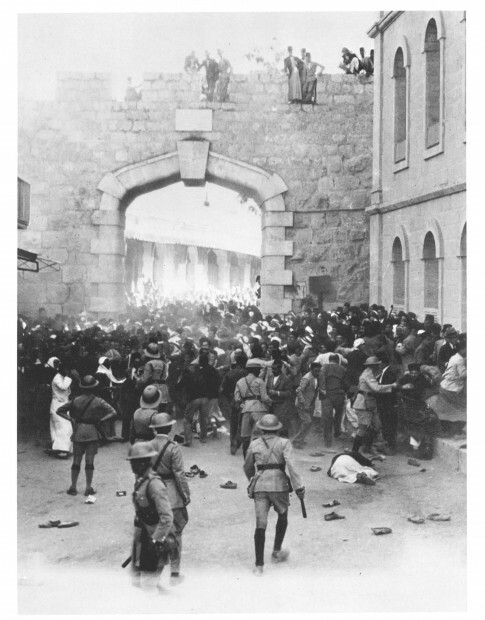 The aftermath of a Palestinian demonstration protesting Zionist mass immigration, New Gate, Jerusalem, 1933. 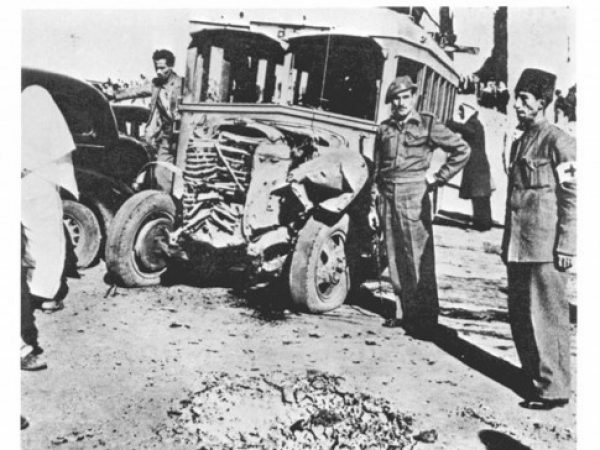 A bomb thrown from a passing taxi at a bus in the Palestinian residential quarter outside Herod's Gate, Jerusalem, on 29 December 1947 killed seventeen Palestinian civilians. 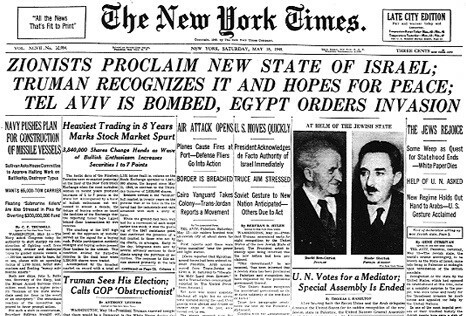 The New York Times’ coverage of the proclamation of the State of ‘Israel’ from May 15, 1948. Firefight between members of the Haganah and the Palestinian resistance, 1947. 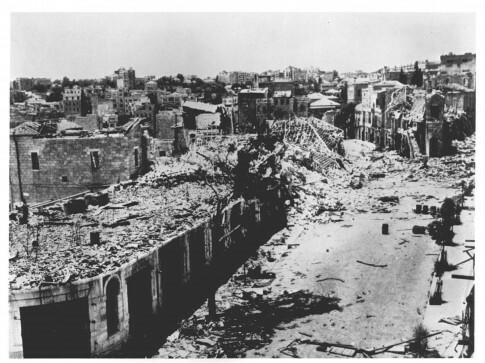 Scenes of devastation in the Palestinian residential quarters of East Jerusalem, April to early May 1948: ruins of the commercial center outside Jaffa Gate. Palestinians and many Arabs commemorated the anniversary of the Balfour Declaration (2 November 1917) with mourning, as indicated by the black flags.